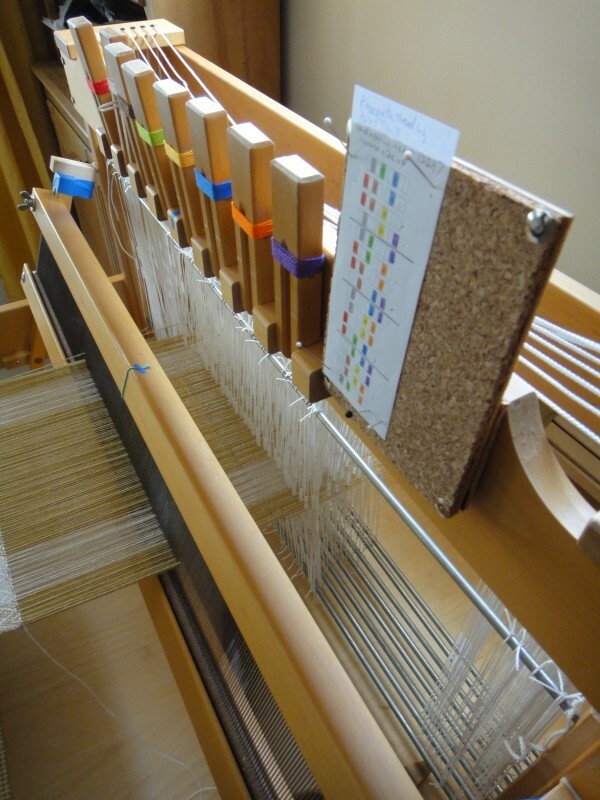 Oooh, the loom is so pretty! I love the colours! What a happy place to sit. Thank you! It makes me happy every time I glance across the room and see it. Definitely pretty! But the colours would mess me up just as much as the numbers. I need a black and white grid instead. Are you going to show us what you’re weaving? That’s interesting. I think a plain grid would *almost* work for me if I could make it big enough, or space the lines out enough, that my eyes wouldn’t get lost. Do you not have that problem? And yes indeed I am! I know exactly what you are saying about the numbers. Colors are much easier for anything visual. The pink tied heddles are exactly the right size for my Bergman. If no one else has claimed them, I would like them.